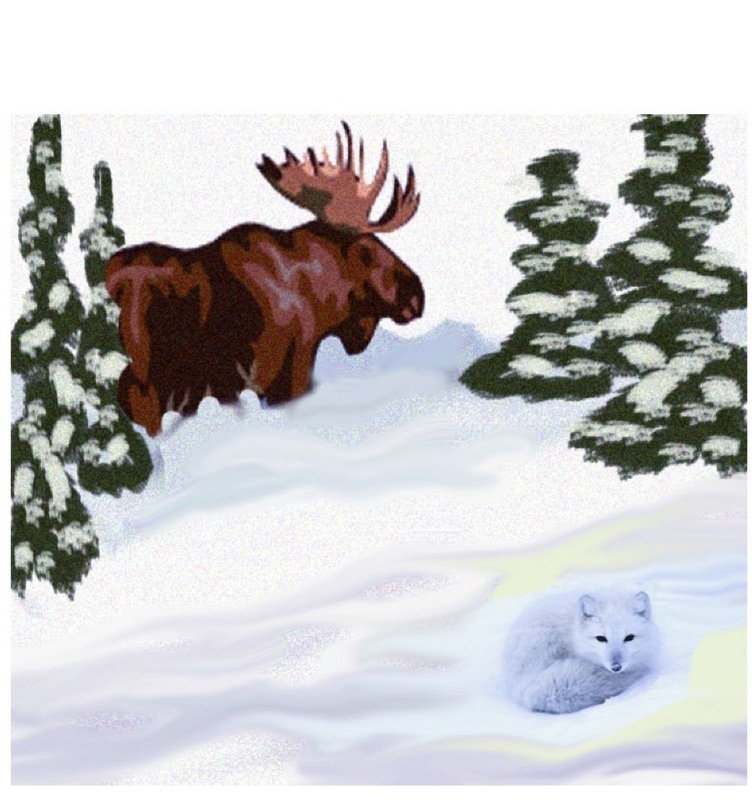 Sebastian, The Christmas Moose, and Icicle, the Lost Fox, and the Search for Flying Reindeer. With a deep snort Sebastian sniffled and caught the scent of pine smoke on the air. The cold air also carried the sound of human laughter. The moose knew he shouldn't get nearer to the human town, but he wanted to see if there any hints of flying reindeer. "Maybe you can later," a soft voice said from near Sebastian's left hoof. The young moose swung his massive head around (to avoid low hanging branches), and down. There, nearly, invisible in the fresh snow, was Icicle. The arctic fox's winter coat blended with the drifts. So, the most Sebastian could discern, was her amber eyes and quivering black nose. “True,” he rumbled wistfully. He knew that night was too new for humans to have gone to sleep, and that in truth he could hear from where they currently stood. But oh how he hated to miss a hint. Icicle knew of her friend's fascination with the humans' bright holiday. After all, she sometimes was his spy in town. Admittedly, she too was curious, though mainly about humans in general. This fact had landed her in a foreign forest, and later to a meeting with a young moose. It was also how she could tell Sebastian what flying felt like. Her own adventure had begun when she was old enough to leave the den, and had spotted a strange, grey, creature in a nearby meadow. She had first thought it some type of large, shiny, boulder - until she had seen upright animals coming in and out of it. She first thought them furless bears, but they neither moved, nor smelled, right. Nor did it explain the rock-like carcass they were coming from. But if it was a carcass then it would mean food, and she had settled into the tall grass waiting for the new beasts to leave. Then she inched her way nearer. The two-leggeds had an odd scent, which seemed to overpower the dead beast's. Though, once inside, she discovered there was no meat to eat on. A cave? The floor didn't feel like any rock she knew. Then noise outside alerted her to hide. But instead of coming back inside the two-legged beasts went on past, and the cave became ebony with a horrendous "CLANG!" The cave creature roared and shuddered the length of its being. And Icicle wedged herself as tight as she could into a tiny space as the supposedly "dead" creature leapt forward. When the monster at last came to rest, and a very shaken fox dared sneak away, she found herself in a completely different forest. It was later, after meeting with Sebastian that she learned she had been on a "plane," and had been "flying." Of course, she had been delighted to tell him that he really didn't want to go flying. Not that her warnings had deterred his fascination with the idea. And she had learned that as a calf that her friend’s mother had liked to graze near where she could hear the humans singing. A pastime the creatures pursued in the deep winter; wandering from house to house. As Sebastian grew he began to recognize words, and finally was able to piece together a tale of a red-nosed reindeer that could fly. So, during the winter, when the humans sang out in the snow, and decorated up their houses he watched and listened. Over a few winters he had come learn that these flying reindeer had to do with a being named, Santa.